CLEMSON, SC – The Atlantic Coast Conference will formally welcome its three newest members – Notre Dame, Pittsburgh and Syracuse – at an afternoon press conference in New York City on Monday. 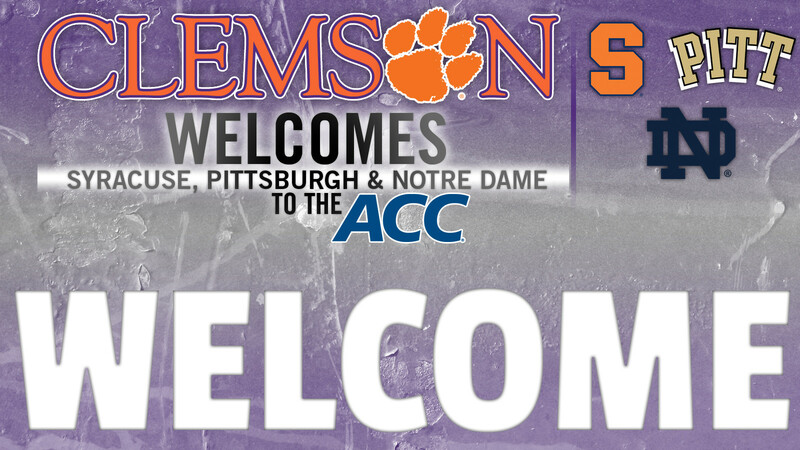 The new members will start competition in the 15-member ACC this fall. Pittsburgh and Syracuse accepted formal invitations to join the ACC in September of 2011, while Notre Dame accepted its invitation in September of 2012. Clemson has competed against the three schools in seven of its active varsity sports, owning a 13-18 cumulative record versus the three. The women’s basketball team owns the most wins, with four in six meetings over Pitt. Clemson’s first athletic competition against one of the new members will be in women’s soccer. The Tigers will play host to Pittsburgh on Thursday, September 19 at Historic Riggs Field. You can also follow @theACC and @CU_Athletics throughout the day on Monday, July 1 as the conference officially welcomes the new members with a press conference, along with several other events and activities, in New York City.